The Loy Krathong Festival 2006 is an annual Thai festival that's a centuries old tradition dating back to the Sukhothai era in the 13th century. This is another aspect of Thai Buddhist culture with a Hindu influence. Hindus release floats on the river in the belief that the river will carry these floats to the Ocean of Milk where Vishnu resides. For Buddhists, this occasion commemorates the visit of Buddha to Naga where he left his footprint on the river bank. The common belief is one of thanksgiving to the goddess of water.The krathong symbolically carries away bad fortune as we wish for better things to come. Please see the Loy Krathong Festival in 2005 for the tradition, ritual of Loy Krathong and the making of a krathong. This year Mother Nature has been harsh. Severe floods have raged through northern and central Thailand affecting 46 out of 76 provinces including parts of Bangkok along the Chao Phraya River. More than 200 lives were lost; homes and farms were flooded incurring billions of baht of damage to property including historical temples and ruins designated as United Nations World Heritage sites in Ayutthaya. Some places like Ang Thong province, about 100 km north of Bangkok, are still under water at the time of writing. In view of this disaster, the Bangkok Metropolitan Authority suspended official celebrations and left it to individuals to conduct their own loy krathong festival. For the Loy Krathong Festival 2006, we took a different approach and visited a number of sites along the Chao Phraya River to see the festival as conducted by the different local communities. Four Chao Phraya River piers and a large lake in the city were covered in the Loy Krathong Festival 2006, to provide different aspects of this attractive Thai festival. We started upriver in the outskirts of Bangkok. 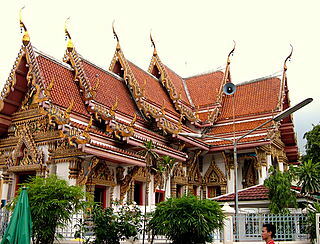 Wat Soi Thong is located at the northern city limits of Bangkok near the King Rama VI and VII bridges. The Wat Soi Thong pier is the last Chao Phraya pier in Bangkok before you pass on to Nonthaburi province. Wat Soi Thong is a beautiful temple with sparkling spires and gables studded with gold, living up to its name of "golden necklace". The grounds were lively with a temple fair of food and krathong vendors. Some of the krathongs sold here were very special, bread baked in the shape of turtles. With water almost up the level of the pier, people floated off krathongs and emptied buckets filled with turtles and eels to the river as part of merit making. Resourceful boys were drifting in the river with big plastic tubs collecting krathongs, retrieving the coins and reselling the floats. In spite of these "recycling efforts", the city cleaners still collected a little over a million krathongs from the rivers and canals the next morning! More natural materials like banana tree trunks were used this year though than in previous years. Our next stop in the Loy Krathong Festival 2006 was at the Bang Po pier the next pier down river. Here the mood was relatively quiet as the local community, families and friends gathered to float their krathongs. Sandbags lining footpaths were a grim reminder of the terrible floods last month. To the plaintive strains of the blind street buskers, residents prayed fervently before floating off their krathongs on the river. As it was early in the evening, I managed to get to the water's edge for the first time in years. So I decided to "loy" a krathong in the spirit of the occasion. It was tricky trying to lower the krathong from a floating pier bobbing in the strong currents. Far from trying to make a wish, I was more concerned about toppling into the river. The wish wouldn't have mattered as the candle was promptly doused by strong winds the moment the krathong hit the water. The atmosphere here was pleasantly subdued, small family groups less the hustle and bustle of organized commercialized activities. The Loy Krathong Festival 2006, further downstream at the Kiak Kai pier, had a bigger crowd. It's another temple fair at Wat Khiaw Fa. This time the crowd, noise and pungent fumes of barbecued cuttlefish were overwhelming. Vendors lined the street all the way to the temple gates. Within the temple grounds, donations for the temple building fund were in top gear while children frolicked in the playground. People streamed to the pier to float their krathongs which were swept away by the strong currents as soon as they were lowered. At the King Rama VIII Bridge, the Loy Krathong Festival 2006 had a completely different air.A procession of lighted boats filed past under the bridge as fireworks and searchlights lit up the dark skies. The light at the top of the suspension tower of the bridge shone like a guiding star in the night. Locals and tourists arrived in droves, forming long queues on the stairs up the bridge to fill both pedestrian footpaths along its entire 600 m span. The scene has definitely lost its rustic charm. The Loy Krathong Festival 2006 at the Chulalongkorn University campus was the only inland site we visited. The grounds were filled to the gates with hardly any standing room. Traditionally floated in a river, here the krathongs were floated off in the huge campus lake. Ironically, it was here, far from the river, that we saw the full beauty and splendor of hundreds of brightly lit krathongs flickering in the night on the placid waters. It’s a tribute to the fortitude of Thais to get on with lives, their customs and traditions in face of adversity. Perhaps it's this cultural ballast that gives the nation its inner strength and tenacity. Another year has almost gone. With the passing of the Loy Krathong Festival 2006, it's hoped that Bangkok and Thailand can look forward to a better year ahead.